Deft Compressor is an audio signal compressor plug-in for professional audio production applications. 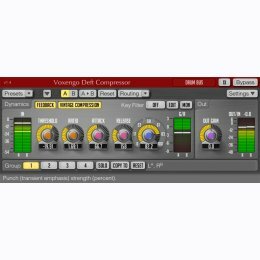 The characteristic feature of this compressor is its ability to produce ï¿½slimï¿½ and ï¿½slickï¿½ sounding compression, with intelligibility enhancement effect. Such result is achieved by compressorï¿½s timing function that closely resembles the S-curve (sigmoid curve) on both attack and release stages. S-curve timing function also helps compressor to sound ï¿½warmï¿½ and ï¿½cleanï¿½ at most settings. While at high attack settings Deft Compressor can be used to emphasize audio transients, it can also be used to ï¿½smashï¿½ audio signal if you use attack settings as low as 0.01 millisecond. Even though the S-curve is the marked feature of Deft Compressor, you can smoothly change it to a steeper L-shape by adjusting the ï¿½Punchï¿½ parameter. Deft Compressor also features a so called ï¿½vintageï¿½ compression mode which produces compression sound reminiscent of analog valve compressors: it produces a warm, gently saturated sound with the ability to overdrive the output signal. Beside that, you may switch between the ï¿½feed-forwardï¿½ and ï¿½feedbackï¿½ compression modes.